It was a cold, rainy day in 1973 when the skydeck of Chicago's Sears Tower—the iconic 110-story skyscraper and still North America's tallest building—was opened to the public. I know this because my mom packed my brother and me into the family station wagon, drove us downtown via underground Wacker Drive to get in line outside the Sears Tower to board the elevator "to the top." I remember a spry, wiry man in line behind us as we hugged the side of this architectural masterpiece to buffer our faces from the wind and rain. For an opening event, the line was quite short by today's standards. Possibly only the architecture fanatics and Chicago history and trivia buffs decided to brave the inclement weather, or the excitement of a little girl with only 10 people ahead of her in line had clouded my perception of how long the line really was. From the skydeck, the view through the floor-to-ceiling glass windows was [predictably] spectacular! We located our house, our grandparent's house, our neighborhhood park, other prestigious buildings and city landmarks as well as locales of a more personal nature. We would have quite the story to tell grandma upon our return. This week, the Sears Tower was renamed. Although its original tenant, Sears Roebuck and Co., vacated the offices in the early 90s, the familiar name of this must-see city landmark remained—until now. The rebranding ceremony took place with Chicago's Mayor Daley (the son of the first Mayor Daley during whose term in office the building was erected and in whose neighborhood we lived) and top personnel from the London-based insurance broker, the Willis Group, to unveil the "Willis Tower" signage. Knowing how die-hard Chicagoans can be, I can imagine the rumblings and grumblings over this news. So here, I too, add my posting to the other on-line editorials, websites and blogs which no doubt run the gamut of emotions, responses and recollections. For a long time, the red, No. 0000011 ticket stub, the accordion-folded brochure of building stats and diagrams, was in a scrapbook along with other childhood collectibles. Alas, the book's location is unknown to me now, but my memory of that blustery, rainy morning and being the 11th person to go to the top of the Sears Tower remains. The task of changing the name on the various and sundry reference materials will hopefully generate revenue for printers, designers, sign painters, mapmakers and the like. 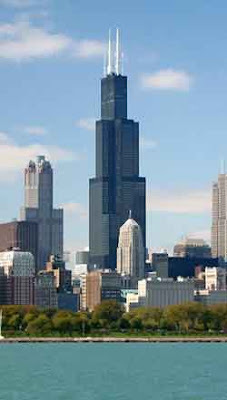 However, this rose by any other name will still be "Sears Tower" to me . . . and I dare say it will for many Chicagoans for quite some time. I say Amen to your comments about Sears Tower. Everything old will be new again because I hear Sears is moving some offices back there....And Chicagoans are not taking to calling that building the Willis Tower so fast. Every talk show host has difficulty too !! Daly has big time power however he got rid of Meigs field overnite, likewise Commiskey park so who knows.